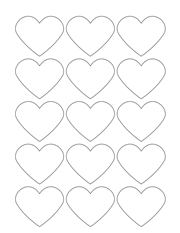 Use our heart shaped labels on your cosmetics for Valentine’s Day or wedding party favors! They add a special touch to your jars of cream and your wrapped soaps, and they are perfect to give to the ones you love. Transform your handmade cosmetics into Valentine’s Day or anniversary gifts by adding this beautiful, glossy, heart-shaped label to your cosmetics. We think it’s great for many linen and body sprays with a 4 ounce sized bottle. Laser printers only. Color: White Label Size: 2.2754" x 1.8872"